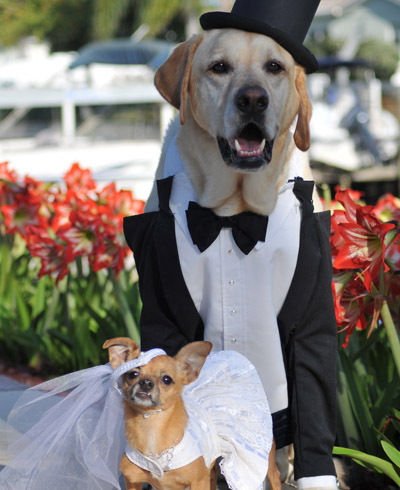 In what will more than likely cause the simultaneous pleasure of several rights groups and fury of activists of a different kind, two dogs in America have gotten married. The canines, Chilly Pasternak and Baby Hope Diamond also happen to be from different states, the former being from New York and the latter from Virginia, proving, of course, that love is no respecter of state boundaries. Pasternak, the groom, who is a poodle and bride Hope Diamond, a white Coton de Tulear with black-gray markings, tied the knot in a lavish black-tie gala which cost $158,187.26. The luxury goods and services that went into the wedding were all donated, and ticket sales for the event will benefit The Humane Society of New York. The new couple also bagged themselves an award in the process, being presented with a Guinness World Record for the most expensive pet wedding. “Just call me the Maid of Honor!” she posted on her website.